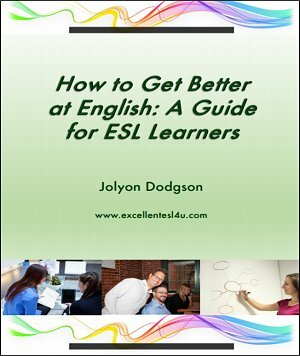 Learning English is not easy, in my free ESL book ‘How to Get Better at English: A Guide for ESL Learners’ I give you help and advice. The book is completely free, all you have to do is sign up to my ESL Ezine (ESL newsletter). 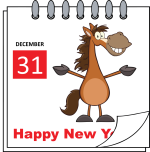 This gives you two benefits: you get the free ESL Ebook and my Ezine every two weeks (or thereabouts) that tells all about the new material published on Excellent ESL 4U. What's in the Free ESL Book? 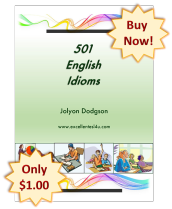 Each of these chapters in the free book is filled with advice to help you learn English faster and more efficiently. The chapters will offer you guidance so that you can know you are learning English well and will soon achieve your goal. There is advice for people who need to try to learn English when working by themselves as well as for people that have a group of friends to help them. I have written this free ESL Ebook from my many years of ESL teaching experience and seeing how my students learn. Not everyone can afford to have an ESL tutor or teacher help them, so the advice that I would normally give to my students in my classes I have included in this book so you can get the information for free to help you learn English better. Remember if you have any questions you can contact me. Just fill in your email address and name below to get your copy of my free ESL book ‘How to Get Better at English: A Guide for ESL Learners’. You will be sent an email to the address that you enter below to confirm that you want to sign-up, once you have confirmed that, you will be able to download the Ebook (the email may take a little time to arrive) from the conformation webpage.